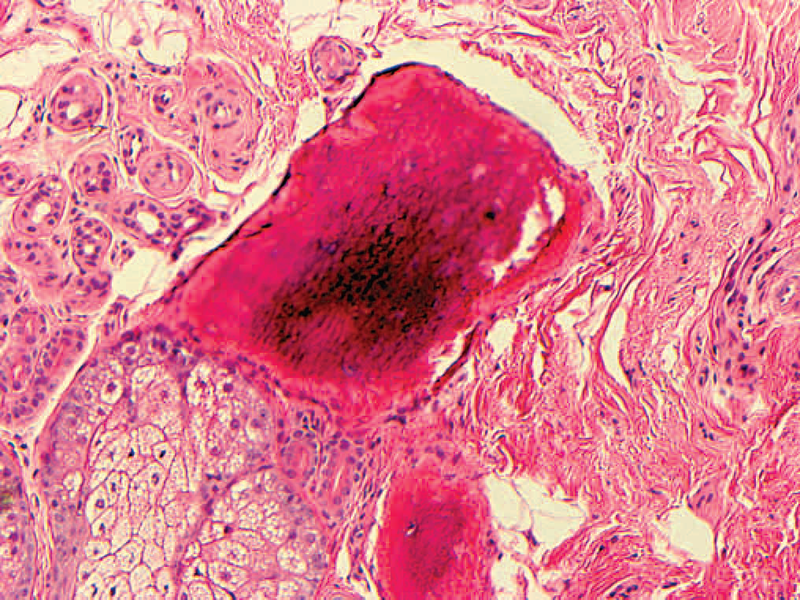 A woman in her 50s with biopsy-proven scalp lichen planopilaris (LPP) presented with an increasing number of slightly pruritic facial papules that coincided with the start of her hair loss condition (Figure, A). She denied a history of severe acne or other inflammatory skin disorders. The patient had no health problems and only had a distant medical history of an appendectomy and an oophorectomy. The only medication she was taking was hydroxychloroquine 200mg twice daily that was initiated as treatment of her LPP and did not improve the appearance or symptoms of her facial papules. On physical examination, she had numerous 1-mm skin-colored grouped monomorphic noninflammatory papules on the bilateral temples, the bilateral cheeks, and the chin. A 3-mm punch biopsy specimen was obtained for histopathologic examination of a representative lesion on the right chin (Figure, B and C).